This homemade marzipan is a great all-purpose marzipan recipe that comes together quickly and uses just three ingredients! This is one of my favorite marzipan recipes—we like it because it has a lovely smooth texture and light almond taste. If you want to boost the almond flavor, add 1/2 to1 teaspoon of almond extract to taste. Coarsely chop up the almond paste with a knife until it is in small quarter-size chunks, and place the almond paste in the bowl of a large stand mixer. Add the powdered sugar to the mixing bowl and mix them together on low speed with the paddle attachment until the almond paste has broken down and everything has a fine, sandy texture. You can use a food processor to mix together the powdered sugar and the almond paste, as well, if that's what you have on hand. With the mixer running on low, slowly add the egg whites until everything comes together in a ball in the mixer. You may find that you do not need to add all of the egg whites. Once the marzipan has formed a ball, take it out of the mixer, dust a workstation with powdered sugar, and knead the marzipan until it is completely smooth and has a nice, pliable texture. You can use the marzipan immediately, or wrap it up for later use. To store it, wrap it tightly with plastic wrap and then place it in a zip-top plastic bag. 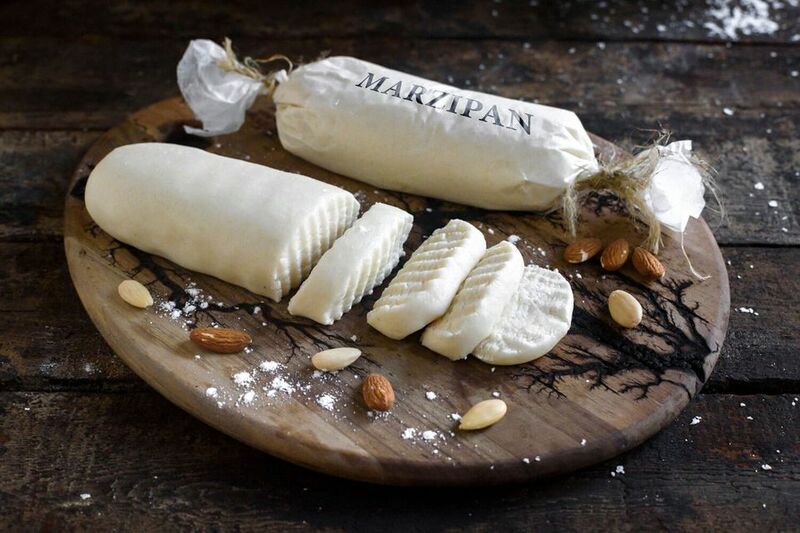 Marzipan will keep for 3 months in the refrigerator or up to 6 months in the freezer. Make sure to bring marzipan to room temperature before using it. Almond paste is available in most large grocery stores. You'll find it in the baking aisle, sold in 7-ounce tubes, or sometimes cans. If you can't find almond paste, you can also use this almond paste recipe to make your own. If the raw egg whites are a concern, use pasteurized egg whites instead.